Paul Stoelting’s sculptures always seem to be sliding away from you. Objects that at first appear relatively straightforward – a length of timber, a picture frame – soon reveal themselves to be unstable, skewed and evasive. 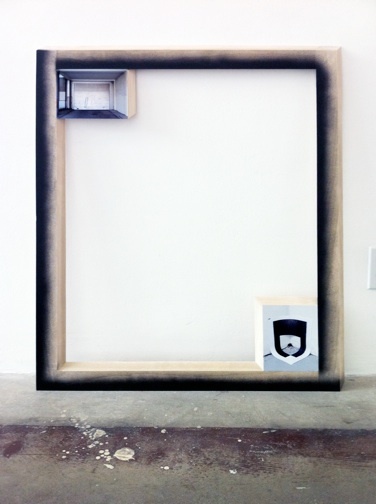 Stoelting’s exhibition Content Aware is dominated by a series of sculptures that look like supports for paintings: rectangular frames of wood hung on or propped against the wall. Closer inspection reveals the wood to be uniformly bevelled at 45 degrees, giving the impression that the object is oriented towards a vanishing point somewhere beyond one or the other of its corners. Since the frames hang against the wall on (what one assumes is) a deliberately ugly, pragmatic block screwed into the masonry, those rectangles whose bevels slope upwards are incapable of hanging without sliding off. Hence their positioning on the floor. All of which is a long way of saying that these sculptures pack a lot into forms so ostensibly simple. They are complicated further by the application of illogical, faux-shadowy spraypaint along certain edges and, most significantly, by the ambiguous photographs fixed to panels at opposite corners. For example, Passage Massage (all works 2011), itself a phonemic stumbling block, is the title of a structure cradling two images: one depicting an empty, nondescript garage and a shot of a folded print that I recognised as a piece of the artist’s earlier work. Reaching for a connection between the two might lead us to their equally striking perspectives, each of which runs counter to the implied perspective of their wooden support, but that’s not really the point. What is significant is the sense of meanings becoming untethered, which is achieved, oddly, by these images being fixed to formally solid sculptural supports. Other works address the subject of framing directly, incorporating photographs of paintings (one kitschy landscape and one Old Master-ish still life) in gilt frames. Perhaps more useful, however, are photographs that show holes – a patched bullet-hole in glass, a hole melted into the plastic of a vending machine. Stoelting’s investigations apply more to the gap than what is around it. Upper Level Managementfeatures a photograph of a computer hard drive in a black puddle – an obsolete information carrier adrift in the void. Less complex are Stoelting’s untitled shelving units – designed by a random mathematical system and consequently askew, unevenly complicated and dubiously useful – and his lengths of warped timber – also untitled, covered in patterned duct tape and slouching against the wall. These latter objects, recalling both André Cadere’s Barres de Bois and John McCracken’s leaning planks, beguile us with their cheerful veneers (one zebra print, one purple tie-dye) and their casual indifference to purpose. Like minimalist punks, they don’t mean anything much, and they don’t seem to care.